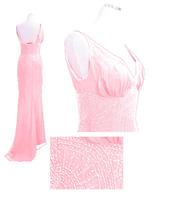 Beaded and sequined silk chiffon prom gown or glamorous pink evening gown. Inspired by the designer runways, this evening dress has a heavily clear-and-pink-beaded waist in a vintage Art Deco pattern and cascading beadwork scattered throughout the dress. Bodice has shirred fabric over soft internal bust cups. Mini train in back for a lovely exit. Beaded Sequin Chiffon Beaded and sequined silk chiffon bridal gown or glamorous white evening gown. Inspired by the designer runways, this wedding dress has a heavily clear-beaded waist in a vintage Art Deco pattern and cascading beadwork scattered throughout the dress. Bodice has shirred fabric over soft internal bust cups. Mini train in back for a lovely exit.